Paul Jordan :: FOUR OUT OF FIVE! Cognac yet again put the pedal to the metal and won his fourth race out of his last five starts. It was a great effort and all connections are thrilled with his performances. He's turned out to be a real bull dog in fighting hard when the pressure goes on. 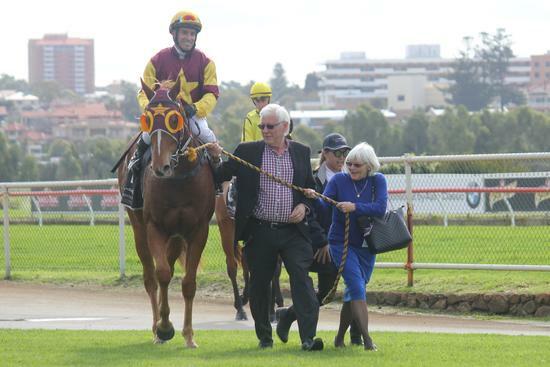 The photo shows managing syndicate owner Harvey Crossman leading the horse in with Mrs. Delice Hogan, both of whom have been great supporters of the stable, but they weren't alone in cheering home this little superstar.